18th November 2014: Following its stint in London's West End, Rock of Ages is currently blowing the roof off theatres up and down the country. Last night was Wimbledon's turn to be rocked and sure enough this jukebox musical delivered. 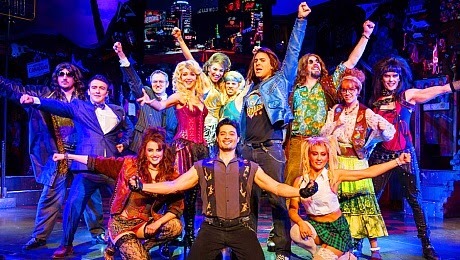 You could say that Rock of Ages is like We Will Rock You's older 'X rated' cousin and you wouldn't be far wrong. Although the book itself is slightly lacking in substance it is almost forgiven in the 2 hour party that the audience is drawn into. 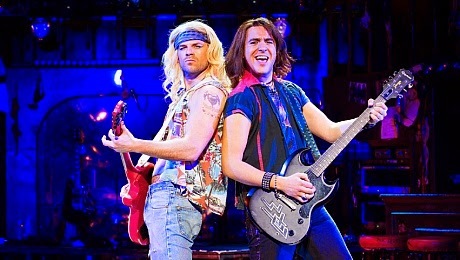 Rock of Ages follows a story that we're all too familer with; two young rockers on the journey to become the next rock god/godess - add a love story, some scandal and a couple of German accents and you've got an awesome feel good show. The shows puppeteer Stephen Rahman-Hughes plays a hilarious Lonny, a 'sound guy' who works for the legendary Dennis Dupree (Daniel Fletcher). Hughes adds a definite spark to the show with his great comic timings and ad libs, he interacts perfectly with audiences and was a certain hit. The shows principle pair and lovers Noel Sullivan (Drew) and Cordelia Farnworth (Sherrie Christian) both give equally impressive performances, they show off their superb rock chops and great acting abilities. Ben Richards (Stacee Jaxx) also secures his place in the rock hall of fame showing off his lungs as well, and plays to the comic side of Stacee extremely well. Supporting our leading ladies and men were a brilliant company, the choreography was extremely polished and ensemble vocals impressive. The visual aspects of the show are brilliant, the fairly static set is brought to life with an explosion of light adding to the shows thrilling rock feel, the show also sounded powerful without being deafening. This awesome show brought to life with its strong cast and great soundtrack of rock anthems had the entire audience on their feet dancing along by the end. Fans of rock or those just wanting a good time, this is one show not to miss...you'll be Rocked for Ages!